HEATEC Ceramic Fiber Cloth is a high temperature fabric made from ceramic yarn, available in a number of different thicknesses and construction to provide a comperhesive high temperature range. Optionally reinforced with chrome wire. This ceramic fiber tape is manufacctured from ceramic fivre yarn whice reinforced with or chrome steel wire. HEATEC CERAMIC Rope is comprised of high-strength CERAMIC Fiber "needled" blanket strip, twisted and wound with a cordage to achieve around, compacted rope product. Since HEATEC CERAMIC rope is not manufactured from textile ceramic fiber years, no organic "carrier" fibers are present, only ceramic fiber. The inherent strength of the base constituent, CERAMIC Fiber blanket strip, is sufficient to eliminate the need for textile process, woven ropes in most applications. 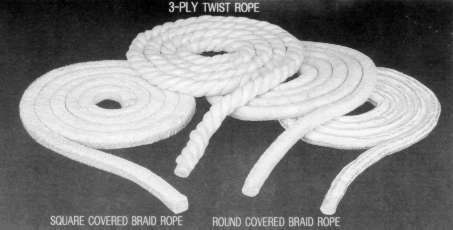 This rope is made by a certain number strands of ceramic yarn twisted tightly together to form a rope with high ten-sile strength. Optionally reinforced with chrome steel wire. HEATEC square rope is braided by ceramic yarn in square section. Optionally reinforced with chrome steel wire.